If you're looking for stair cleaning services in Odessa FL call Chem-Dry of Tampa. 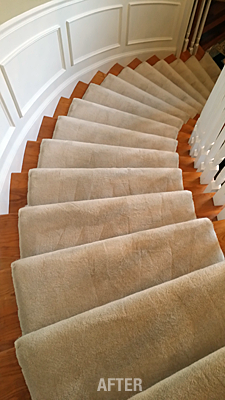 We have the experience to restore your carpeted stairs to like new condition. Stairs take a tremendous beating during everyday use and can soil quickly. Take a look at these before and after pictures of a carpeted staircase in Odessa FL. The stairs have several spots and heavy traffic lane grey that has built up over time. They can't be simply cleaned. They needed some heavy duty scrubbing to get out the built up soil. These stairs where vacuumed, then pre-sprayed with an emulsifier that breaks down heavy traffic soil. 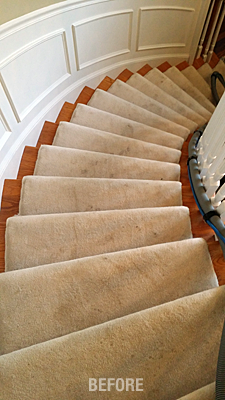 After giving it some dwell time, allowing the pre-spray to work, the stairs where brush with a horse hair brush. The agitation from the brush helps break down some of the tougher spots. Finally each step was cleaned using Chem-Dry's hot carbonated cleaning process to extract the maximum amount of dirt and soil without over wetting the carpet. These particular stairs could not stay wet for long because excess moisture could cause damage to the exposed wood on the steps. That's why the Chem-Dry stair cleaning process was perfect for these stairs. Chem-Dry's fast drying cleaning solution allows for a deep clean with 1/5 the moisture that other steam cleaners use. We were able to clean these stairs and have them dry in about two hours. The home owner has absolutely thrilled with the results. If you need stair cleaning in Odessa FL call Chem-Dry of Tampa Today.